The Stratford Shakespeare Festival opened its 60th season with its 10th production of Shakespeare’s comedy Much Ado About Nothing. It marked the first time Christopher Newton, former Artistic Director of the Shaw Festival, has ever directed at Stratford. 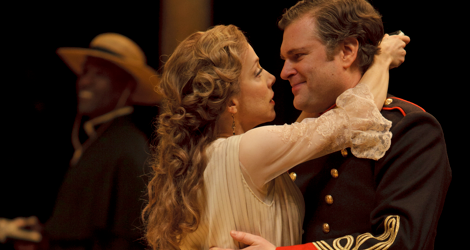 With Ben Carlson and his real-life wife Deborah Hay as the warring couple Benedick and Beatrice, the production had the makings of an exceptionally fine show. What was surprising is that the result was rather ordinary and generally dull. While Carlson and Hay do give excellent performances, they have to struggle to lift the production out of overall lethargy. At the Shaw Festival, Christopher Newton was renowned for his direction of comedy, yet in this Much Ado the principal flaw is its deliberate pacing and lack of momentum. When the soldiers arrive back in Messina at the start of the play, it should infuse that town with energy. Indeed, much of the problems Don Pedro and Claudio face is that they are still wound up after the war and look on domestic situations with eyes too keen to see intrigue and deceit. In part, Newton seems to have sacrificed pacing for the sake of atmosphere. The frequent piano interludes that give a clue to the setting are pleasant enough in themselves but retard the action. Newton and designer Santo Loquasto have transferred the setting of the play from Messina, Italy, to the state of Bahia in Brazil. Perhaps this was suggested to Newton because the last emperor of Brazil was named Dom Pedro II and there is a Don Pedro in the play. Yet rather than place the action at the time of Dom Pedro II’s abdication in 1889, Newton and Loquasto have moved up the time period to the 1920s. The result is that even if you happen to divine that the setting is Brazil, which is not at all clear, and even if you recognize the flag of the Empire of Brazil waved about in Act 1, you will be confused why everyone in dressed in Twenties styles. Compounding the problem is that lighting designer Robert Thomson never suggests that we are in a tropical location. He is fine at creating a soft autumnal mood, except that a state as close to the equator as Bahia does not have our northern autumn. Newton also makes two key errors in characterization. The worse is in introducing the evil Don John (Gareth Potter) as a comic figure, parading about with his cigarette held palm-upwards like the parody of a Gestapo officer. When Act 2 opens with Don John alone waiting for Hero’s wedding to begin, the audience burst out in laughter – hardly the right mood for a scene we know will lead to tragedy. I’ve noted this innumerable times about other failed productions, but for comedy to have the sense of urgency that makes it comic there must also be a real sense of danger. To defang our villain from the start removes this danger. Less worse is Newton’s attempt to minimize the comedy of the town constable Dogberry (Richard Binsley). Binsley has demonstrated frequently in the past what a fine comic actor he is, but here he is directed to speak Dogberry’s lines so quickly that the multiple malapropisms that makes them so funny go by too quickly to register. The chief virtue of the production are the performances of Carlson and Hay. More than in any previous production I’ve seen these two suggest that Beatrice and Benedick’s present insult-trading derives from a relationship they had sometime in the past. Hay is especially good at conveying this notion and the idea that she could indeed fall for Benedick again if he would only set aside his egotism. For his part, Carlson suggests that Benedick’s present belligerent anti-marriage stance is simply a foolish generalization from this past failed relationship. Carlson and Hay thus show clearly but subtly that the constant bickering of Beatrice and Benedick conceals a strong desire to get together again though each is too proud to take the first step. If only there were any subtlety about the parallel couple of Hero and Claudio. Both Bethany Jillard and Tyrone Savage are graduates of Stratford’s Birmingham Conservatory, which, on past evidence, seems to specialize in teaching its students to speak Shakespearean verse without understanding what they are saying. Shakespeare’s words flow freely and clearly from both Jillard and Savage but they are accompanied only by generalized emotion, not by an ability to interpret them through emphasis or intonation. Savage fails to establish Claudio’s tinderbox nature after he mistakes what happens after the masked dance, and his rage at Hero during the wedding scene is completely lost in bluster. James Blendick is a dependable Leonato, whose age doesn’t prevent him from being caught up in condemning Hero. Juan Chioran is excellent as Don Pedro (not the Brazilian emperor) and shows clearly as Savage should with Claudio, that he has not left the soldier in him behind with the war. Michael Blake does a fine job as Borachio, Don John, conspirator, and the sincerity he brings to his confession of guilt almost wrings sympathy from us for his terrible deed. Stratford’s latest Much Ado is thus a mixture of plusses and minuses. Seeing Carlson and Hay will give you more insight into this famous couple than the past several productions at Stratford have ever done. Yet, they alone are able to bring sparkle to a production too saturated with the languid torpor of its peculiar setting. Photo: Deborah Hay and Ben Carlson (with Timothy D. Stickney as Friar Francis in background). ©2012 David Hou.